Your Catalog to D@D Content. Dunrovin Ranch is a happening place that generates lots of fun and exciting content. This is where you can explore it all. Both Dunrovin Ranch's content and the DaysAtDunrovin community are ever changing. 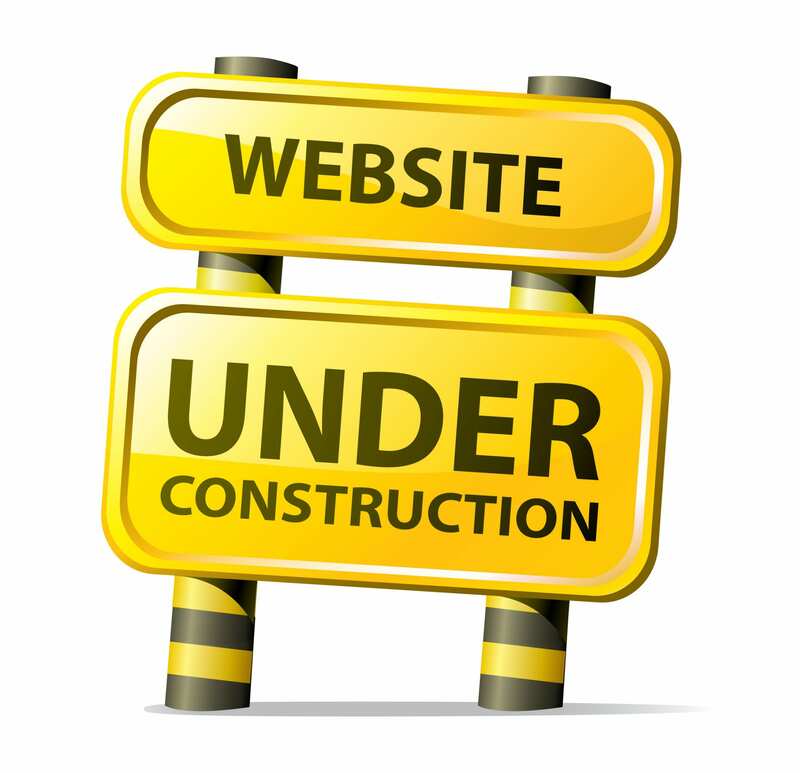 We will constantly adjust this page to accommodate new items, respond to members' suggestions, and explore new paths. 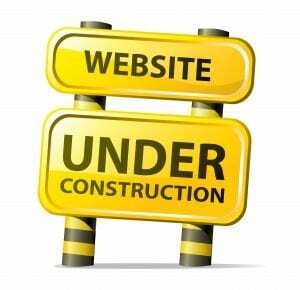 Please note that the EXPLORE section of the DaysAtDunrovin website is currently under construction. 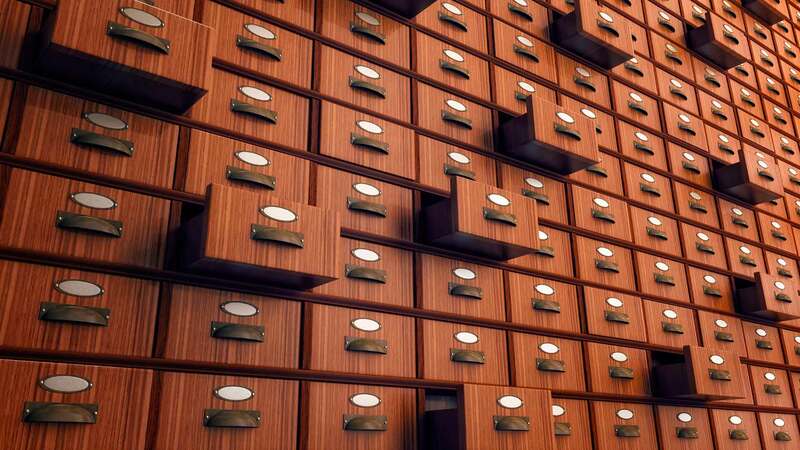 D@D has a ton of historical material to organize and add so you can dig as deeply as you like in any topic. Thank you for your patience. Know Where You Want to Go? Here Are Your QUICK CLICKS! From Book Club, to Musical Chairs, to Great American Criminal Trials, to Dunrovin Key Quest, to Ranch Talk, to Learning Adventures of all kinds and everything in between, this is the place to find it. What do endangered animals, textile art, meditation, archival newspaper comic strip restoration, and animal communication have to do with one another? 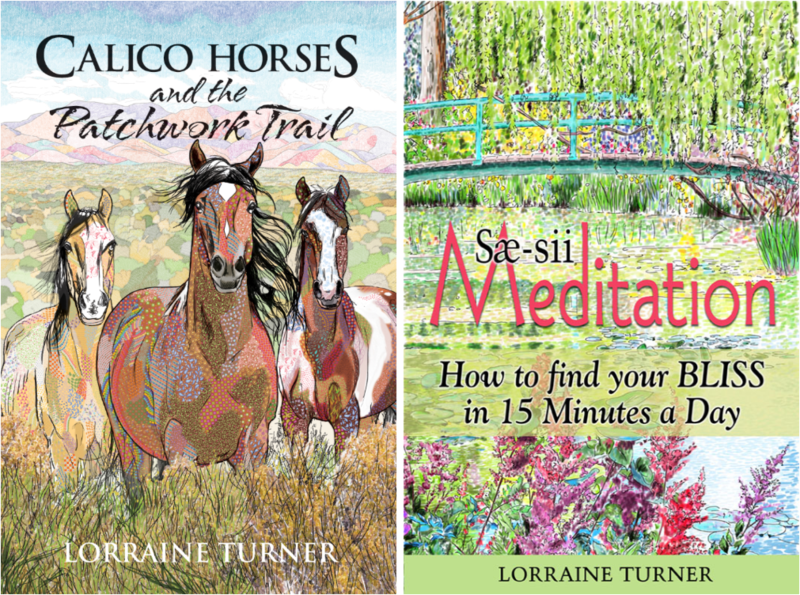 Delve into the world of Lorraine Turner and follow along as she takes you behind the scenes of her multi-faceted career. a child who was told she would never make it as an artist, who became a two-time Emmy winner for her work as the lead designer for the Philadelphia 76ers National Basketball Assoc. a motivational speaker who travels worldwide encouraging all ages from teens seeking careers to seniors desiring adult education. a multiple Eisner award nominee in her role as the art director for the Library of American Comics a company she co-owns with her husband Dean Mullaney. a professional animal communicator who works by connecting to the animal’s energy using photographs. She has taught this to children as young as eight. 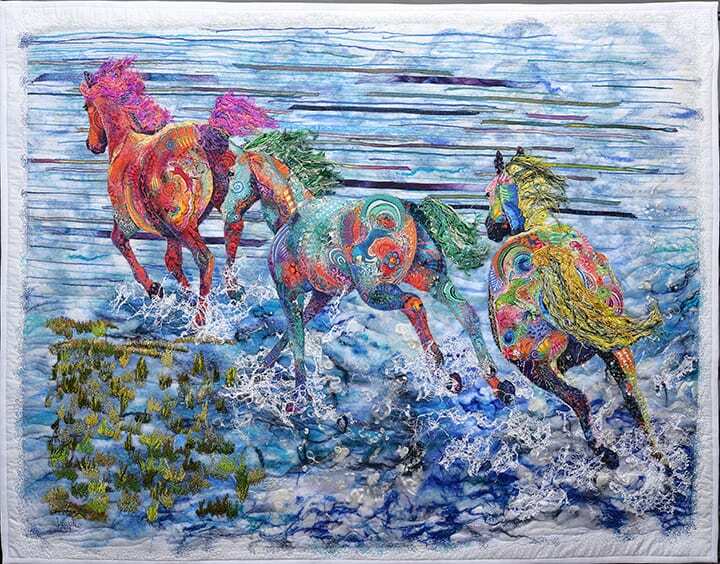 an internationally acclaimed textile artist who has been featured on television and magazines. All of her art supports endangered animals. 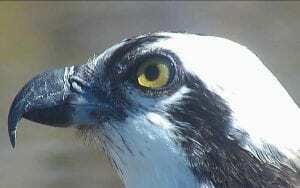 Early in the spring of 2012, Dunrovin Ranch received an email from the principal of a school in Santa Anna, California saying that all 700 of their students were watching the Dunrovin osprey nest. 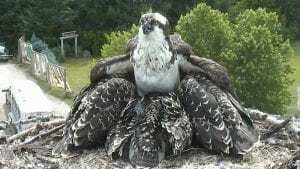 SuzAnne got so excited at the thought of school kids learning about ospreys that she created the Awesome Osprey Project in 2013. The project brought school kids with senior members of the D@D community together to research the question of how much time the male osprey spends incubating the osprey eggs relative to the female. The project drew the attention of 54 different classrooms across North America and everyone reports having great fun learning about the ospreys and getting to know one another. 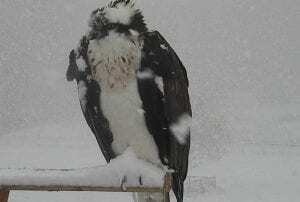 The Awesome Osprey was repeated in 2014, but had to be canceled for 2015 when the male bird was killed by an eagle. 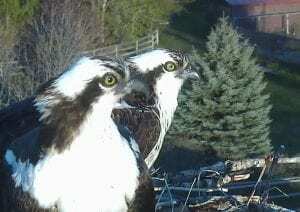 The project was restarted in 2018 and will continue as long as the ospreys return. This three week collaboration consists of participants collecting primary data from observation of the birds during the egg incubation period. During the first week of the project, participants learn to distinguish the male bird from the female and to identify and understand different bird behaviors, such as preening, tending eggs, and incubating. 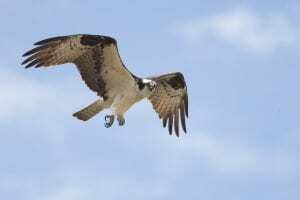 Week two consists of observing the osprey via the Dunrovin osprey webcam and recording data according to an established sampling protocol. At the end of week two, participants enter their data into a Survey Monkey for Dunrovin to compile into a master data spreadsheet that is immediately returned to them for analysis during week three. People of any age or grade can participate. Several years ago, DaysAtDunrovin experimented with creating a “cyber” book club like none other. We not only wanted to share some good reads with our fellow D@D members, we wanted to engage some literary professionals to deepen our discussions and possibly engage some of the people involved in the books, like the authors themselves or principal characters. We didn’t know if it was possible to facilitate truly meaningful book discussions online, but we did know that many of our D@D members are avid readers and sharing books is an excellent way to get to know one another. So, we forged ahead and developed a club format that we hoped would work. Distinctly Montana carried an article about our initial efforts in their Summer 2015 edition (flip to page 29). 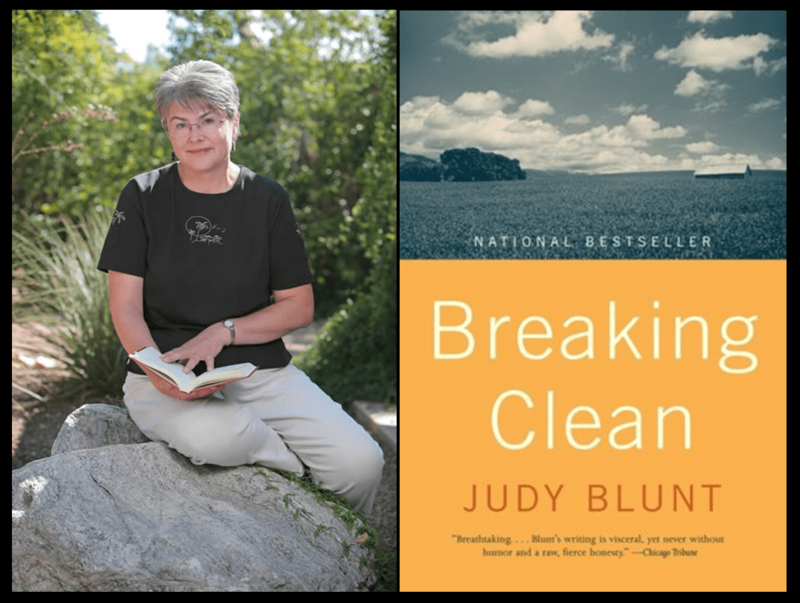 How very fortunate we are to have University of Montana English Professor and nationally known author, Judy Blunt, serve as the literary guide for our DaysAtDunrovin book club. Judy is the D@D book club’s content person, responsible for selecting quality books and enriching our discussions. 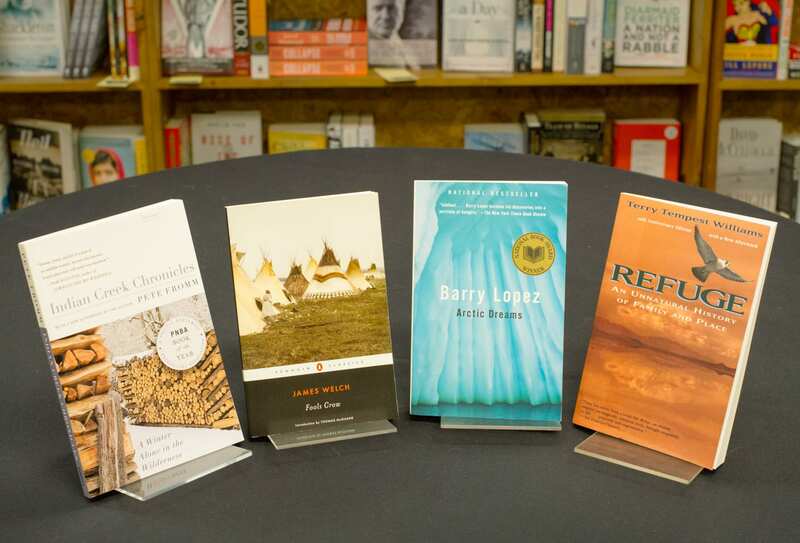 Since the beginning of our book club in the winter of 2015, Judy has unerringly selected books that are beautifully written, showcase the American west, and delve into universal themes that resonate with readers regardless of where they live. Her wide connections with the literary world enable her to bring people intimately involved with each book, such as the authors themselves, into our discussions. Rarely do book club readers have such a privilege of directly engaging with the authors of the books included in the club’s selection, but we do! 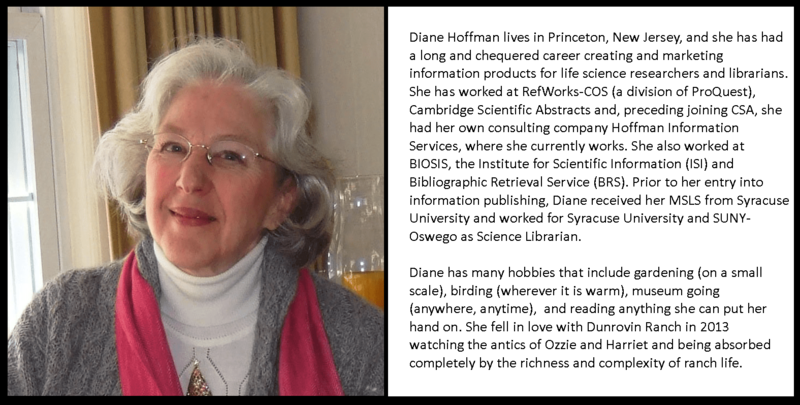 We are delighted and honored to have Diane Hoffman serve as our online host. Diane builds a bridge between the club’s chat sessions and the live broadcast, on-site discussions with Judy and the books’ authors. Diane's background and interests makes her the perfect person to facilitate some good conversations on the books. 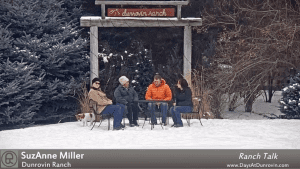 During the two chat sessions that occur each month, Diane facilitates the discussions, takes notes, and summarizes D@D members’ comments into a guide that Judy and SuzAnne then use for the live broadcast session with the books’ authors. Diane is the online discussion person. 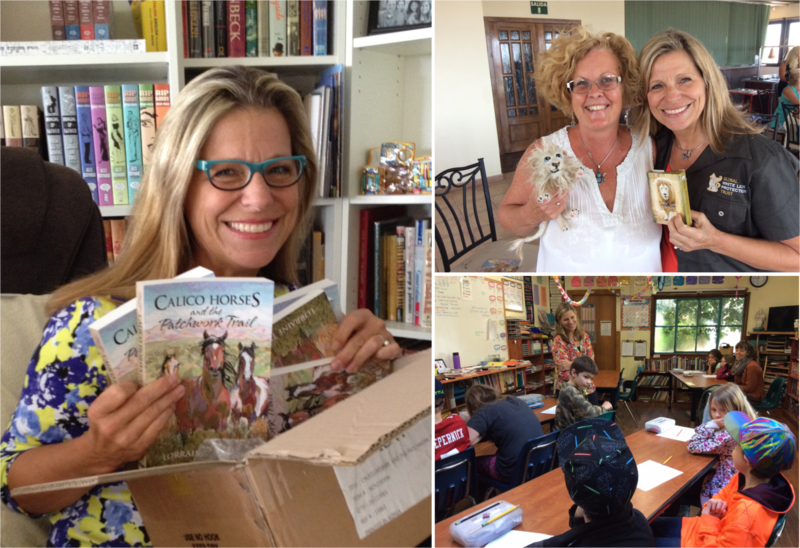 Dunrovin Ranch owner, SuzAnne Miller, assists Judy in selecting the book and serves as the on-site program host. SuzAnne’s job is to get the technology set up to bring the books’ authors into the conversation through a live broadcast, either at Dunrovin Ranch or via a Google Hangout connection, to bring Diane and D@D members into the discussion via the telephone, and to keep an eye on the clock and keep the conversation moving through the discussion guide. SuzAnne is the club’s process person. 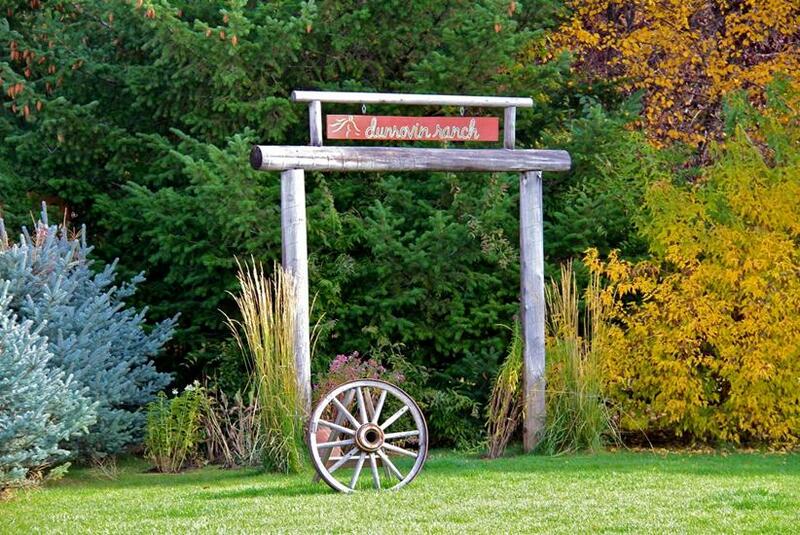 Dunrovin Ranch is surrounded by, steeped in, and subject to nature in all her glory. 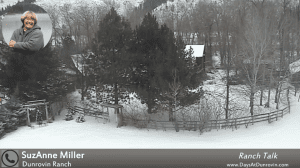 DaysAtDunrovin's array of outdoor web cameras are specifically designed to bring the natural sights and sounds of Dunrovin Ranch into your life through the magic of the internet. We strive to help you connect with nature, even when your personal circumstances prevent you from going outside. Humans have evolved to make sense of nature. All of our senses are programmed to tune into nature's sights, sounds, smells, and textures. It was once critical to our very survival. It is in our DNA. While modern life may remove us more and more from nature, it is not able to remove nature from us. Connecting with nature is to reconnect with a central part of what it means to be human and with our place in the natural world. Nature is healing and essential to our physical, mental, spiritual, and emotional well-being. Being in nature reduces blood pressure, boosts our immune systems, relieves stress, calms us and improves our moods, and helps us focus. Experts and research tell us that you can can enjoy the benefits of nature even if you cannot go outside. Listening to natural sounds, seeing natural images, bringing a little nature inside in the form of live plants and fish aquariums are all ways to include nature in your home. GoExploreNature.com list 10 things that people can do to help connect their kids to nature while in-doors. Well, D@D believes that the kid in all of us is just lurking beneath the surface waiting to be acknowledged, so there is no reason we can't incorporate some of these suggestions right here in our DaysAtDunrovin community. Some of these things we can do collectively, right here at Dunrovin Ranch. Others we can each do individually, at home, to later share with one another. We've dropped two of their suggestion and added one of our own. D@D feels strongly about the importance of keeping nature in our lives regardless of our ability to be out in it. While our web cameras and microphones are a great asset in immersing us in the sights and sounds of nature at Dunrovin, we want to also to hear your nature stories, learn about your ways of enjoying nature where you are, and experience the natural surrounding of your own neighborhoods. This is the purpose of D@D's Connecting with Nature Program. 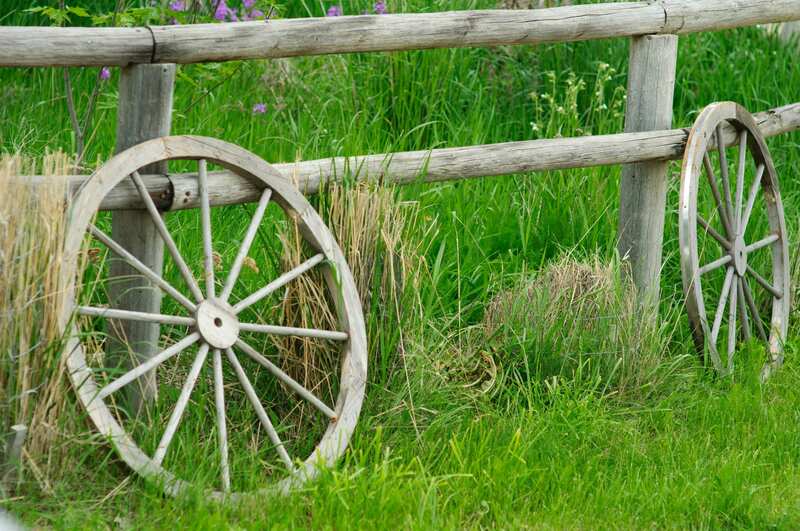 Our goal is to share and enjoy the beauty and benefits of nature that surrounds Dunrovin Ranch, to learn about your natural surroundings, and to develop techniques each of us can employ to summon the benefits of being in nature regardless of where we are. To achieve our goals we will invite some guides to show us the way - people who have dedicated much of their lives in one way or another to connecting people with nature, teaching others how to look deeply into our natural surroundings, and helping people create personal habits that strengthen our connections to the natural world. 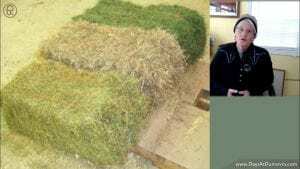 We propose to do nature focused community projects along the lines of those suggested above. We hope to learn and explore and create ways to keep nature close at hand, in our minds, and fulfilling our hearts regardless of our circumstances. Great American trials? Why on earth is Dunrovin Ranch offering broadcasts focused on great American trials? Well, let me tell you how it happened. It is a blessing to be near a university town. Colleges and universities have a way of invigorating communities with young people, professionals with wide interests, artists, authors, foreigners, and eccentrics of all kinds to liven up our social and cultural lives. The University of Montana does all that and more. My husband Sterling and I are particularly drawn to UM for numerous reasons. It is where we met – in soils class to be exact. He was a wildlife biology major and I was majoring in forestry. Both of our sons attended UM. Jake graduated with a degree in English before going on to law school and Mark was there three years before transferring to Montana State University for a degree in computer science. UM’s emphasis on wildlife and birds naturally taps into Dunrovin‘s interests. Within the last few years, Sterling and I have discovered another wonderful part of the University of Montana, and that is, its Molli Program. This is a program for “learning for the love of it” for people who are at least 50 years old. We pay an annual membership then select and register for any number of fun and interesting classes, pay some class fees, and off to class we go. It is an extremely popular program; so much so, that you have to get online immediately on the day registration begins in order to get a seat. Sterling and I scour the course catalog and frequently take classes together. During several Molli classes, I found myself wanting to include our DaysAtDunrovin members as I was certain that they too would enjoy these short courses covering a large range of different topics. Well, that is exactly what is prompting me to create a couple of D@D broadcast focused on two great American trials. It all started when Sterling and I signed up for a Molli class last year entitled Great American Criminal Trials. It was taught by an attorney, law professor, and head of the Montana Innocence Project, Larry Mansch. It was a terrific look at six trials that had resonated through American history. Larry was infectious in his enthusiasm, a very responsive teacher, and had well-organized material. In short, it was a terrific class that prompted lots of discussions among the participants. At the end of the class, I approached Larry and told him of my interest in bringing his fun class to our D@D members. 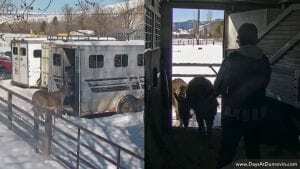 Happily, he was most receptive and agreed to come out to Dunrovin Ranch to see what we were doing. Larry and his wife Kim spent a lovely afternoon with Sterling and me on our deck discussing all manner of issues. By the end, he said that he was willing to participate in an experiment D@D class to see if we could develop a format that would engage all of you with his topic. We also agreed that we should start with a format that has already been successful in getting all of you engaged, namely our book club format. Instead of Molli classes, I am going to call these programs D@D Learning Adventures. I hope you will join us for this first Learning Adventure and help me create a long-term Learning Adventure Program that could be fun for all of us. Our first episodes of Great American Criminal Trials occurred in October and November of 2018. We hope to keep this series going as long as Larry is interested in participating. And as I have gotten to know him, it is clear that he loves nothing better than sharing his love of history! Larry grew up in Minnesota. He attended Hamline University in St. Paul, majoring in Political Science/Public Administration. He earned six varsity letters in baseball and basketball before graduating in 1980. He then attended the Creighton University School of Law, graduating in 1983, and moved to the West. He has spent most of his legal career working in criminal law. He clerked for Judge R.C. McDonough in Glendive, and then became one of Montana’s first full-time public defenders. He served as Senior Attorney with the Missoula PD office until 1999, and then went into private practice. Larry has tried cases all across Montana, in both State and Federal courts. 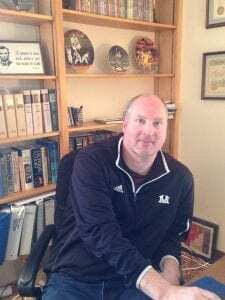 Seeking a change of direction, Larry earned his Masters in Education from the University of Montana in 2006, and spent the next ten years teaching U.S. History and Social Studies. He also served in the Montana Army National Guard as a Judge Advocate General, retiring as a Lt. Colonel in 2011. Larry joined the Montana Innocence Project when the organization was founded in 2008, and became the Legal and Clinic Director in 2014. Under his leadership, in the past three years the Project has secured the exonerations of six people wrongfully convicted of crimes they did not commit. Larry also teaches classes in Criminal Adjudication and Wrongful Convictions at UM, and is a MOLLI instructor. He has authored five books, including biographies of Abraham Lincoln (ghostwritten for George McGovern), Martin Luther, and baseball Hall of Famer Rube Marquard. Larry was married to Kim, the former Executive Director of Missoula’s Partnership Health Center, who died in early 2019. They have four grown children, Bethany, Lincoln, Abigail, and Madison. 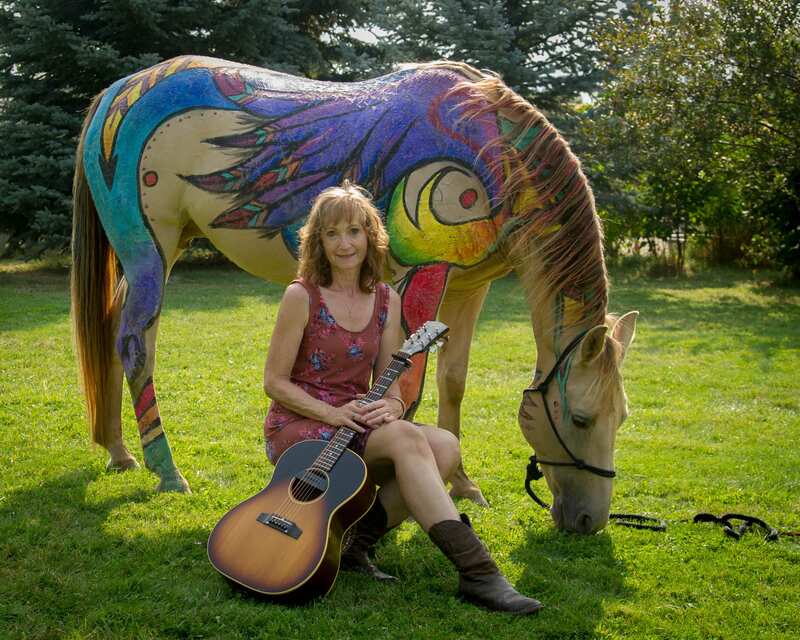 Music is healing, inspiring, quieting, arousing, enriching, and dramatic. It is expressive of all emotions and goes well beyond words. It nourishes the souls and expands the mind. 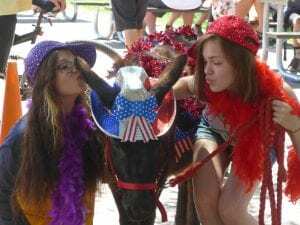 A guest ranch is a place for many different activities that incorporate music: weddings, theater performances, celebrations, barn dances, and festivals. 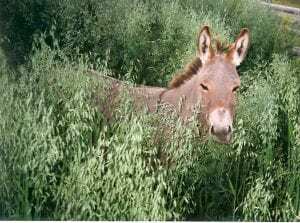 Nature and our animals also chime in.The whistling wind , chirping ospreys, melodious meadowlarks, trilling red winged blackbirds honking geese, braying donkeys, and barking dogs and whining horses all add to the sounds of Dunrovin. 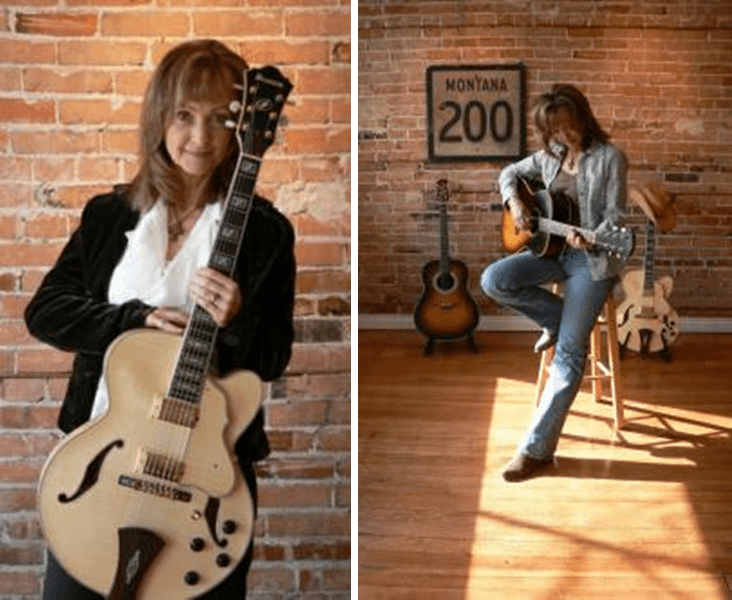 Dunrovin had teamed up with a long time friend and extraordinary musician, song writer, and singer, Charla Bauman to turn the entire concept of musical chairs on its head. Instead of pulling a chair when the music stops, we're encouraging you to pull up a chair and join in a musical collaboration to bring a wide range of sound treats, from scored music, to sound baths, to jam sessions, to ringing bells to recordings of nature to refresh our minds, lift our spirits and to bring us together as a community through music. We hope you will bring your musical interests and talents to the program to help us craft a musical learning adventure like no other. 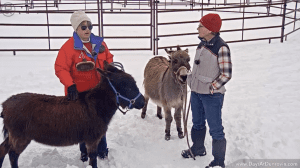 The owners of Dunrovin Ranch, SuzAnne and Sterling Miller are both scientists who have worked as researchers for decades for natural resource and wildlife management agencies, primarily the Alaska Department of Fish and Game. Sterling is a wildlife biologist with long list of scientific publications after his name. Most of his research centered on bears, both black and grizzly. SuzAnne was the chief biometrician (mathematics as applied to biological problems) for both the Division of Wildlife Conservation and the Division of Commercial Fisheries in Alaska where which brought her into working with a wide range of species from shell fish, to birds, to mammals. Science is, in fact, responsible for creating DaysAtDunrovin. 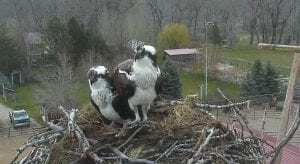 The original web camera was installed above Dunrovin's osprey nest in 2011 in collaboration with the University of Montana's Project Osprey, which was a research project designed to better understand osprey ecology and determine the health of some of Montana's rivers relative to heavy metal contamination by studying the blood chemistry of osprey chicks, who eat only fish from local waters. The interest of viewers of that original webcam prompted the creation of DaysAtDunrovin. Luring Diane Friend as our Science Guide. Dunrovin first got involved with astronomer, mathematician, and geologist Diane Friend when she agreed to ride to the forest lookout with ranch guests to spend the night when them exploring the night sky. The trip was called The Big Sky at Night and it was a big hit because of Diane's infectious love of her science and her ability to make it fun and understandable for everyone. She was the proverbial "kid in the candy shoppe" with her her powered telescope. It was nearly dawn before anyone went to bed. Diane is back to host our spring 2019 Science Lab sessions that will focus on night skies. Our hope is that she and YOU will enjoy this serious enough to partner up to develop many more science lab features. Diane is ready to be your science "boots on the ground" and take you wherever your curiosity demands. She will find the experts, put together the materials, and learn right along with everyone else. Let your imaginations fly. This promises to be lots of fun! From continuing chapter stories about the Dunrovin osprey family or training Oggy to one time short stories about an interesting character or unusual event, this is where the storytelling happens. 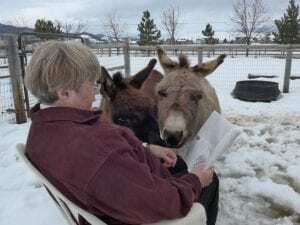 Jennets Turn into Demanding Donkey DIVAS at Dunrovin. 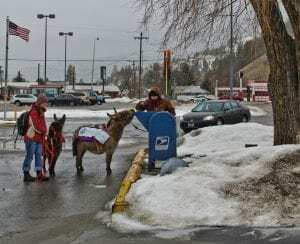 As this photo tells, Miss Gertie and Miss Maude were the darling-est little jennet donkeys when they arrived at Dunrovin right off of a big ranch in central Montana. Shy, retiring, and totally adorable, they captured everyone hearts and attention. As they grew, so did their ids and egos! These two now assume that Dunrovin Ranch is all about them. And we lack the courage to argue with them. 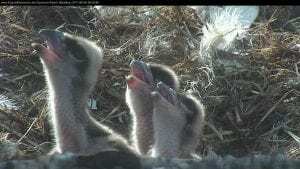 How Wonderful to Share the Ospreys' World. 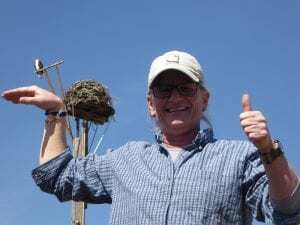 What an enormous gift to have a huge, old, and very active ospreys' nest on Dunrovin Ranch. 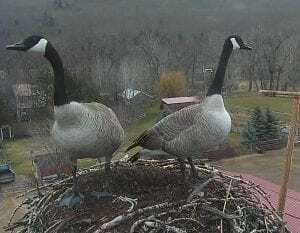 The nest is at least 30 years old and has been in almost continual use each breeding season, from early April through mid September. After installing the web camera in 2011, Dunrovin Ranch had kept records of all the comings and goings at the nest and has watched in wonder as these beautiful birds struggle to breed, raise, and fledge their chicks each year. Horses Are Indeed Poetry in Motion. Horses and man have evolved together. We are both social creatures, wanting to form trusted bonds with others - even other species. Living with horses is to learn on a visceral level the values of trust, patience, intention, listening, controlling ones' energy and emotions, and looking first to one's self to solve any problem. Bonding with a horse is to cross the predator/prey divide and open windows on new perspectives. Come Back Soon. This content is currently under construction and should be completed within the next few weeks. Life is Certainly Sweeter with a Dog. 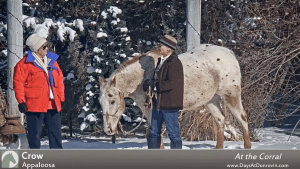 Ranches are the natural habitat for dogs of all kinds. They are integral parts of the operation. 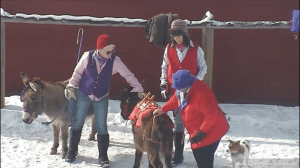 Guest ranch dogs perform special duties. Some are trail scouts. They lead mountain trails ride to sweep away the grouse that love to flush at the last moment and scare the horses. Others keep rodent populations in check, patrolling the hay barn for mice and the fields for gophers. All work in customer service, with wagging tails and happy faces for every person at the door. Birds Dare to Fall so They Can Learn to Fly. Birds lift our spirits, spark our imaginations, greet the mornings and punctuate our days with music, and fill our minds with wonder and awe. Oh, to be able to fly! Dunrovin fields and forests along the Bitterroot River are a haven for birds of many different species, from song birds, to woodpeckers, to water fowl, to shore birds, to majestic birds of prey such as golden and bald eagles, hawks, falcons, and, of course, ospreys. Dunrovin is alive with birds in every season. Reminders of Who We Are. Humans share the natural world with all other species. Being in nature calms us; watching wildlife reminds us of our roots when daily life for us was much like it continues to be for them. Our urbanized dwellings may have taken out of nature and out of the wild, but it does not taken nature and the wild out of us. Our senses, our spirits, and our souls replenish when we allow ourselves to reconnect with nature. The People Make the Place. Dunrovin Ranch and D@D are fortunate to be connected with wonderful people, both near and far. 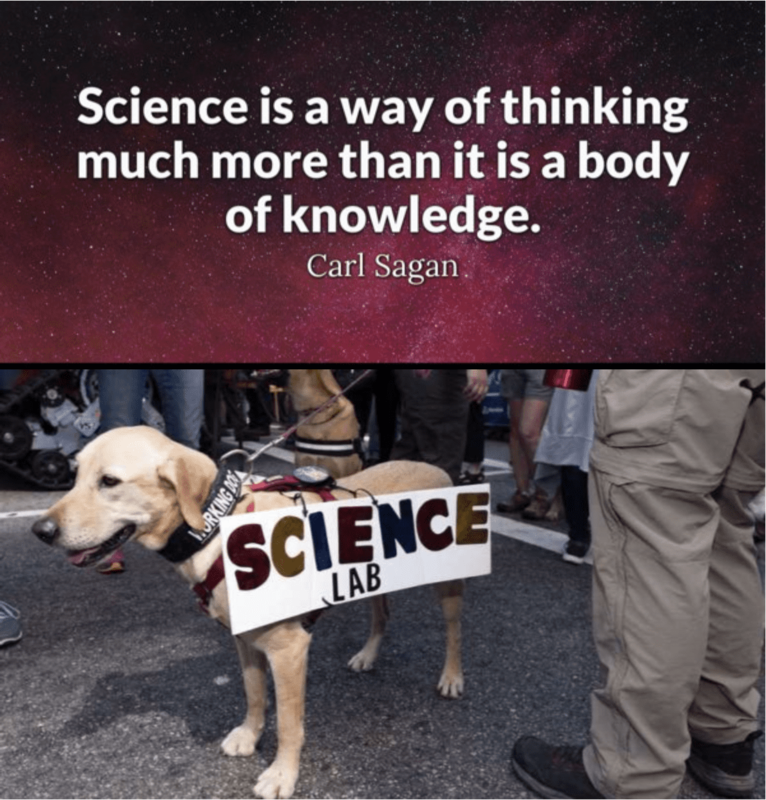 Nature, animals, science and the arts seem to attract special people - curious people who love learning, sharing, and getting to know one another. Dunrovin is grateful for its onsite and online friends who have formed a community that truly crosses the digital divide. We invite YOU to take an active role and add your name to the list of people who help make this place happen. From swapping recipes, to getting technical support, to volunteering to participate in science or art projects, to making suggestions for future programs, discussion boards are embedded in various website pages to facilitate conversations and communicate your ideas to the D@D staff. Please be sure to stay on topic when appropriate and let us know if you think we need to start a new discussion board. The Ranch Discussion Board appears on all of the live camera pages. This board focuses on all thing Dunrovin, so please confine your posts and conversations to activities at the ranch. The Technical Support Discussion Board appears at the end of the Tech Support page. 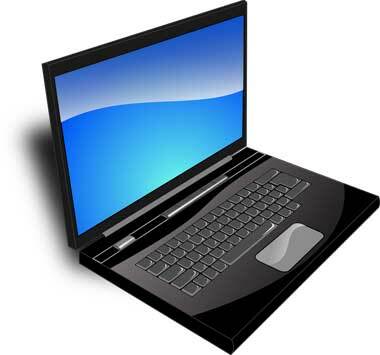 We encourage you to post your tech support questions so that others may also benefit from the discussion. Chances are that if you are having trouble, others might be vexed by the same issue! Some programs have their own discussion boards to facilitate conversations regarding the topic at hand. These boards appears on the website page dedicated to each program. 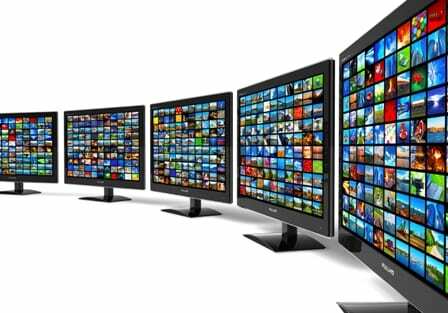 Here's the place to find any program broadcasts that you may have missed. Recordings are unedited, posted immediately after each broadcast, and organized by date so you can quickly catch up on your favorite programs. Cant' find what you want? Try looking here. This is where you can see the most recent content and search all of DaysAtDunrovin's content posts by category.